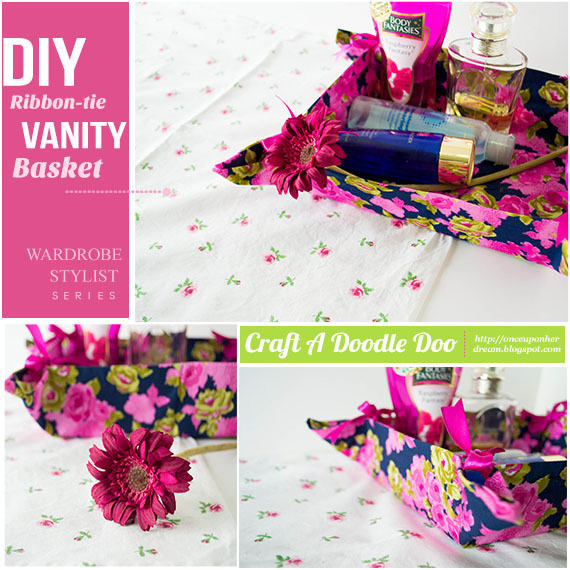 Craft A Doodle Doo: The Decorista Chronicles//DIY Ribbon-Tie Vanity Basket! 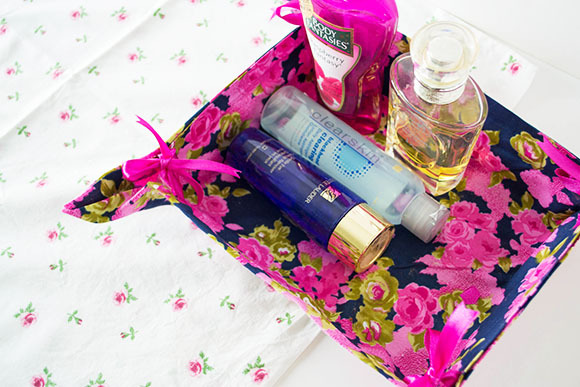 The Decorista Chronicles//DIY Ribbon-Tie Vanity Basket! Haven't we all wished for that drop-dead gorgeous vanity? (Ladies, that question was for you!). This ribbon-tie vanity basket was gifted by me to my darling mum who was more than thrilled to have it. It sits now on her vanity and practically rules the place (read:the dressing table). 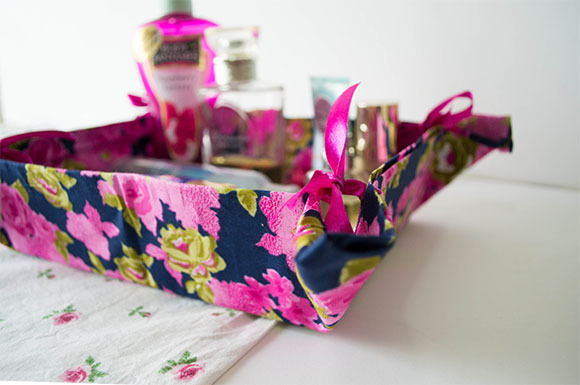 It organizes her perfumes, makeup and lotions and reminds her that she has a "kinda" sweet daughter! Note, my sweethearts, that this post is the second feature of the Wardrobe Stylist Series. 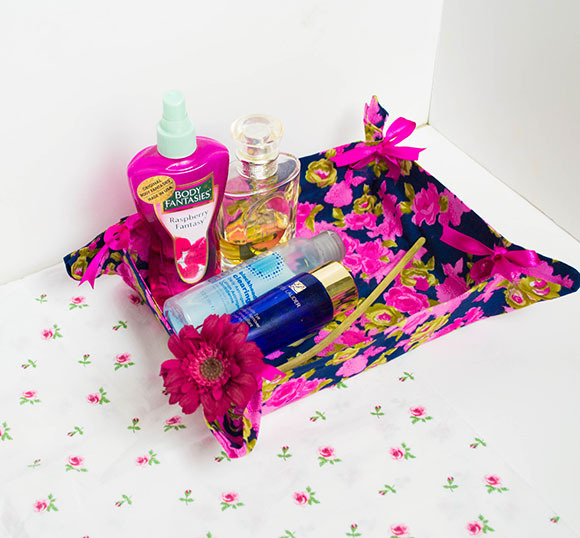 You can check out the frst feature: DIY Closet Organizer here! 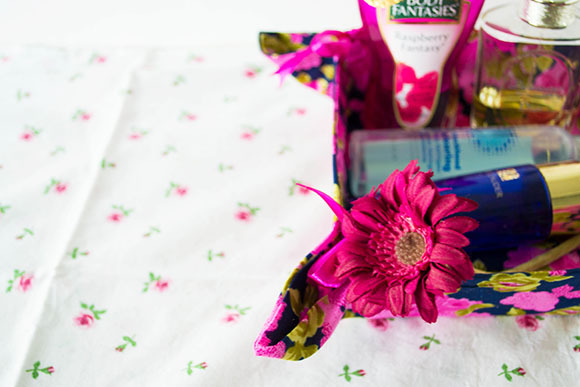 And oh yes, here's the super tip for this, you should totally upcycle cereal boxes to make these! For the pictures below, I use normal thin cardboard because I didn't have any cereal boxes or other empty ones of the sort at hand. 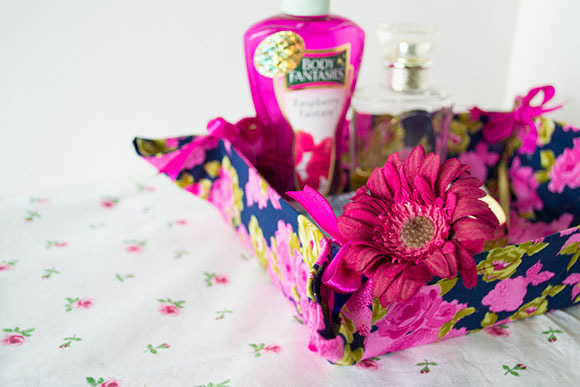 The cardboard from cereal boxes is of the perfect density or thickness to be malleable for this pretty basket! Let me begin by saying I'm horrible at sewing. Plainly horrible. I can manage basic stitches which is why for newbies like me, you need fabric glue, Yes! That thing is a life-saver! But, if you are a seamstress, then by all means, use needle and thread for the whole basket! 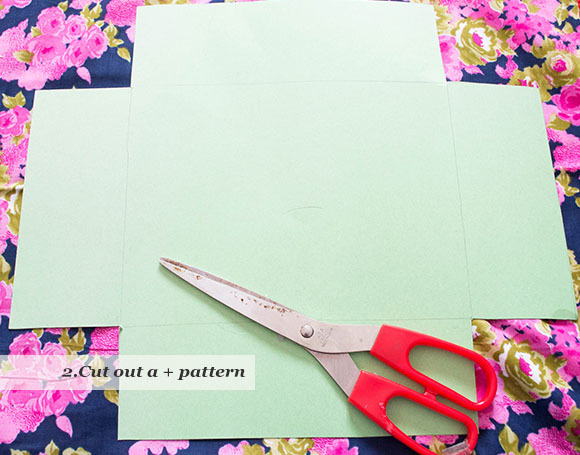 1.You'll need to cut out a basic "+" pattern template at first. I threw out the candy from a candy box (I put it later, don't worry) and used that as a guide. 2.Fold over your entire fabric.You'll need a rectangle/square of the fabric that measures a bit bigger than the whole +template. Then cut it out from one side. You'll have double thesize of the fabric required to cut one side since we need to cover both sides of the +. 3.Now the reason we cut out slightly larger fabric than the one needed for the template is this! Neat borders! 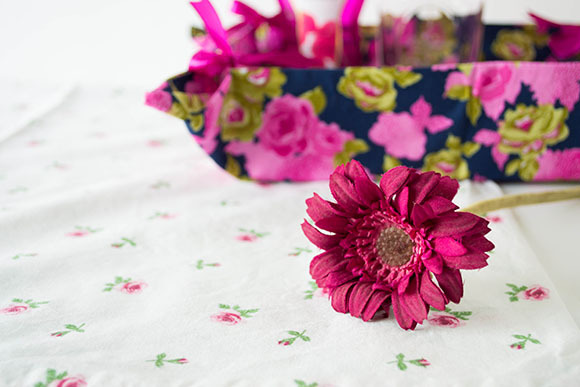 Fold over that extra fabric and secure it with a few pins. Then go all along the way little by little and affix it with fabric glue. 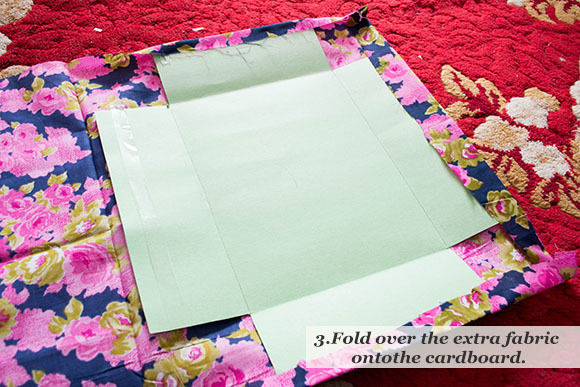 4.Now fold over the other half of the fabric to completely cover your template. 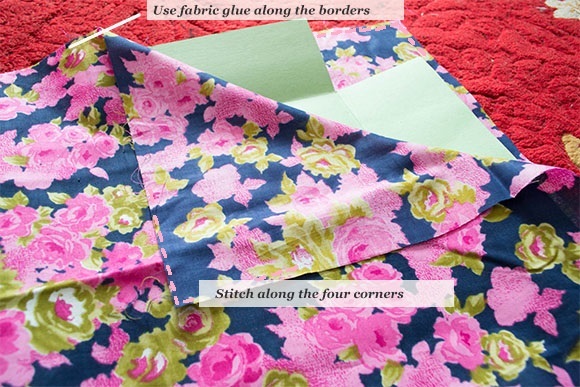 Stitch the corners and secure the rest of the borders with fabric glue. You'll want to stitch the corresponding four corners of one half of the fabric with those four corners of the other half. This has been shown using baby pink lines in the above picture! 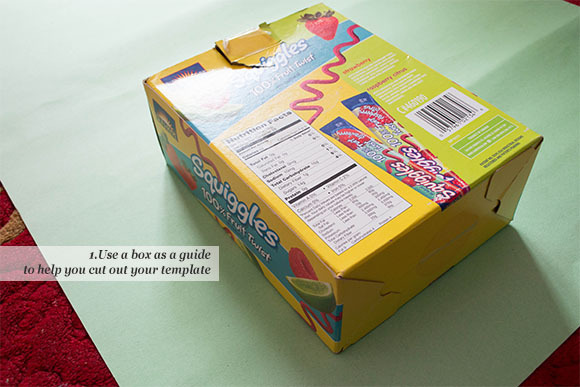 5.Your template should now be like an insert that has been sandwiched in between the two folds of the fabric. 7.Remember the creases we made earlier? Make the flaps stand upright using those creases and the + shape to guide you. Tie the two ribbons at each corner together. Do this for all four sides. This doesn't account for just your lotions and perfumes. Corral in your jewelry and accessories too! Chuck in your go-to bodyspray! And don't forget to take a breather and smile! I hope the instructions were clear and helpful. Don't forget to pin this if you loved it! for an explosion of awesomeness! When you have stitched them, how tightly you tie them determines how stiffly the sides stand up. The Decorista Chronicles//DIY Closet Organizer! Craving Ravings// Juicy Chicken Shaslik!